"Vroom-Vroom Vroomy Vroom-Vroom!" My son loves repeating that phrase from Mo Willems' cute book, Don't Let the Pigeon Drive the Bus! Now he has even more reason to say Vroom. Why say Vroom? 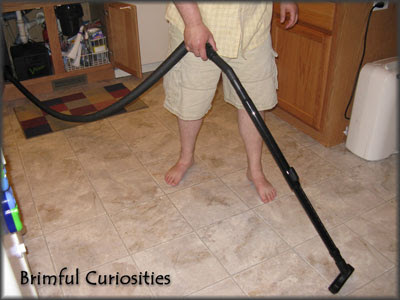 Well, lucky me, I am one of 30 mommy bloggers chosen to review the Vroom™ Solo Vacuum. 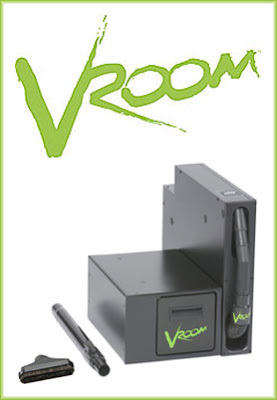 Vroom, manufactured by H-P Products, is all about convenience and designed for quick clean-ups. The self-contained vacuum with a retractable hose installs under the sink and stays out-of-sight/out-of-mind until you need it to tackle those everyday messes. Crumbs, cereal, pet hair, crushed crackers and other food bits -- for me keeping the kitchen floor mess-free is next to impossible. My husband calls me the world's messiest cook. Inevitably food will end up on the floor when I'm in the kitchen. Vroom Solo helps to quickly clean up the dry spills and messes left by kids, pets and mommies and daddies, too. The versatile product can also be installed in bathrooms, garages, basements, laundry rooms, workshops, wherever quick clean-up is needed. My husband installed our Vroom in our kitchen cabinet. It fit perfectly, installation only took around 45 minutes, and the directions were fairly easy to follow so long as you understand simple wiring techniques. The components take up the entire left side of our cabinet as you can see in the picture. We've used the Vroom several times and enjoy the convenience. The vacuum is rather loud but in the same respect it has very powerful suction and easily picks up all sorts of stuff off the floor. The retractable hose extends the full 24' with wand, so we can reach all areas of our kitchen and thanks to our open-floor house arrangement we can also vacuum parts of our laundry room, bathroom and dining room. While the product is pretty well designed, here are the nit-picky things we think Vroom could possibly improve on: 1)Even though, the wiring works fine, my husband would like to see a better connection type and way to allow for wire management so that the connecting wire isn't so exposed. 2)I'd prefer a switch or button on/off, instead of the hose handle position auto on/off. 3. )Vacuuming at long distances from the unit takes a little effort due to the tension in the hose. It might help to have some sort of hose lock mode, to keep the hose from wanting to retract. 4. )I'd love to see a bagless, canister model. All in all, it is pretty darn easy to "Vroom your room!" I won't miss reaching for my broom/dustpan or dragging out my regular heavy vacuum from the storage area to clean up those everyday, annoying messes. Two Vroom Solos will be given away, so don't miss it! You can also enter the Vroom giveaway at I'm a Hot Mom (Ends 6/26/09) or register to win a Vroom Solo on the VroomYourRoom.com website. Thanks to Twitter Moms and Vroom for the review opportunity. Sounds great, I'm gonna have to get one. When I first saw the pic, I was like what is that thing, doesn't look like a vac at all. But you explained everything great and I cook like you do and I have a Husky (tons of hair). When we get done moving, I plan on buying one. That is pretty neat. I had never heard of this product. I'll have to check it out! !